These all serve as reminders to me, because on some days my fatigue still sends me to bed for a short nap. Healing keeps its own schedule, even though my hospitalization feels like an incident far in the past. My body is in no great rush to bounce back, even though I also have peppier days. It all gives me the same cognitive dissonance that I had felt when my partner and I enjoyed a recent meal out, and a bit of math informed me that our server -- a young adult, mind you -- could have been our granddaughter. Someone's been monkeying around with time warps when we weren't looking. According to the medical affairs arm of Xarelto's customer support, the drug has a half-life in my demographic of 11-13 hours. 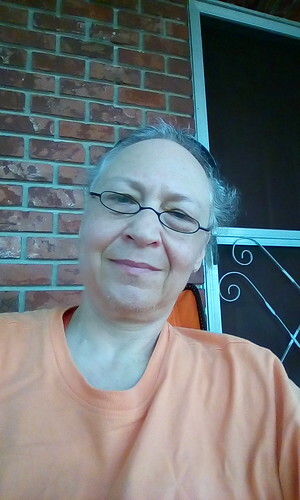 I had called because I wanted to know how long I would have to wait once I completed treatment, before I could return to activities that were contraindicated like taking aspirin. I am very thankful that I rarely need analgesics, but right now I am limited to Tylenol. I will need to do yard work before I'm off Xarelto. Given my carpal tunnel syndrome exacerbation (a side effect that's been linked to anastrazole use), that activity will require several doses of anti-inflammatory. What with my added variables of cancer treatment, Xarelto's customer support told me to get the definitive answer from my doctor as to when I can return to taking aspirin. I see my oncologist in late April, so will check with him then. I spent a lovely afternoon on my porch this past Sunday -- writing, reading, taking photographs, drinking coffee. 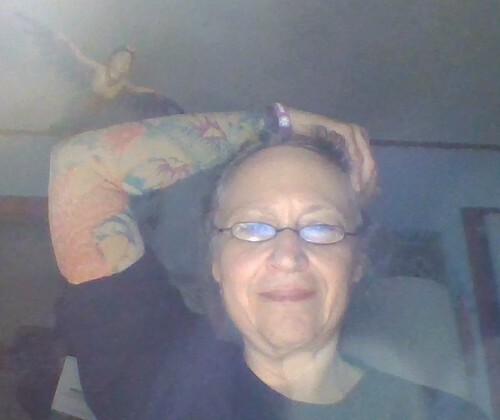 In the past I would bring out my folding chair, along with my Kobo Mini e-reader; journal notebook and pen, plus a book weight to help hold the pages flat as I wrote; camera; and lap desk, in addition to my coffee. I might add my MP3 player and earbuds -- though when I'm out on my porch, I prefer listening to the bird song around me instead. 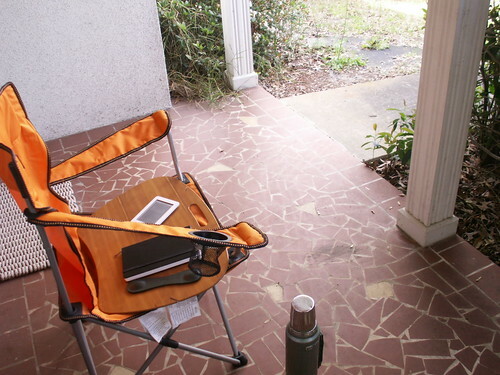 On Sunday I had brought out my folding chair, a mug of coffee, and my new tablet. Period. I wrote in a free notes app. I read using a free e-reader app. I took photos using the camera that came with the tablet. The tablet case that I had purchased doubled as a stand. If I had wanted to listen to music, I could have done that through the tablet, too. If I had wanted to get online, I could have done that from the porch as well. Reading in bed is another pleasure, which my Kobo Mini had returned to me. At 4.7 oz., it is kind to my hands and wrists and its changeable font size is kind to my presbyopia. I wore a headlamp in the dark to compensate for its lack of backlighting. Now, my tablet provides the backlighting and its case/stand frees my hands altogether. I can also break from my reading and do some writing (or digital painting, or other activities), all on the one device. I still carry the Kobo with me because it is perfect if all I want to do is read. With its WiFi turned off, its battery lasts for weeks on end. Its small size makes it easy to whip out, say, in a long checkout line. Technology helps me transcend my circumstances. I don't need much to enhance my quality of life, even as my circumstances effectively shrink my world. My blood clot aftereffects add to a steady stream of changes that include fatigue and vertigo from cancer treatment, the myriad adjustments that come with being a caregiver, and garden variety aging. I count myself lucky in that I had done a fair amount of traveling while young. In general, I have done much in my life that I had wanted to do, and I know that many people don't have that opportunity. These days I don't mind the physical shrinking of my world because it has expanded in other ways, in great part thanks to technology. When chemo interfered with my ability to both read and write, digital painting helped me fill that creative gap. E-reading aided my return to tackling book-length works, not only by making those books available and accessible but also by making the handling of them easier on my eyes and hands. I could go on. In short, my focus has shifted to answering the question: What lessens my quality of life, and what can help me restore and enhance it? Thanks to digital painting, I recently contributed a drawing to the Citrus Cultural Alliance's third annual coloring book (forthcoming). The first two books had been geared toward children. The third book is geared more toward adults. This year's theme is "Citrus County's Natural and Cultural Heritage." Proceeds from sales will go toward CCA internships. My drawing includes tracings made from my photos of Florida Tasselflower and Phaon Crescent butterfly, both found in my yard.